You can increase your computer memory by installing memory modules on the system board. Your computer supports DDR2 memory. For additional information on the type of memory supported by your computer, see the appropriate specifications for your system in this book. When installed in pairs, DDR2 memory modules should be of matched memory size and speed. If the DDR2 memory modules are not installed in matched pairs, the computer will continue to operate, but with a slight reduction in performance. See the label on the upper-right or upper-left corner of the module to determine the module's capacity. NOTE: Always install DDR2 memory modules in the order indicated on the system board. CAUTION: Do not install ECC memory modules. If you install mixed pairs of PC2-5300 (DDR2 667-MHz) and PC2-6400 (DDR2 800-MHz) memory, the modules function at the speed of the slowest module installed. 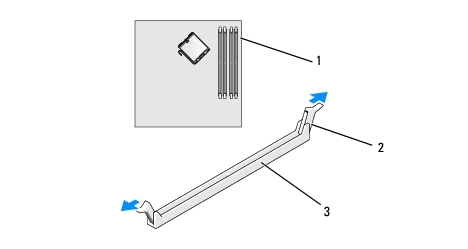 Be sure to install a single memory module in DIMM connector 1, the connector closest to the processor, before you install modules in any other connector. NOTE: The Ultra Small Form Factor supports only DIMM connectors 1 and 2. CAUTION: If you remove your original memory modules from the computer during a memory upgrade, keep them separate from any new modules that you may have, even if you purchased the new modules from Dell. If possible, do not pair an original memory module with a new memory module. Otherwise, your computer may not start properly. 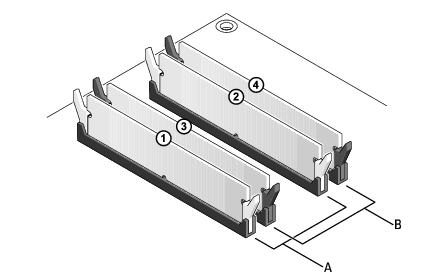 You should install your original memory modules in pairs either in DIMM connectors 1 and 2 or DIMM connectors 3 and 4. NOTE: Memory purchased from Dell is covered under your computer warranty. CAUTION: To avoid electrostatic discharge and damage to internal components, ground yourself by using a wrist grounding strap or by periodically touching an unpainted metal surface on the computer chassis. Remove the computer cover (see "Removing the Computer Cover" for your specific computer). 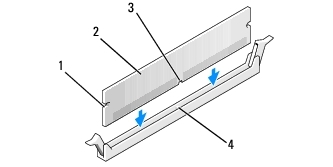 Press out the securing clip at each end of the memory module connector. 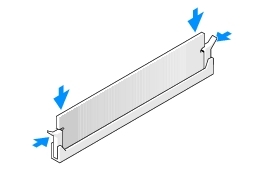 Align the notch on the bottom of the module with the crossbar in the connector. CAUTION: To avoid damage to the memory module, press the module straight down into the connector while you apply equal force to each end of the module. Insert the module into the connector until the module snaps into position. If you insert the module correctly, the securing clips snap into the cutouts at each end of the module. CAUTION: To connect a network cable, first plug the cable into the network port or device and then plug it into the computer. When the message appears stating that memory size has changed, press <F1> to continue. Right-click the My Computer icon on your Windows desktop and click Properties. To verify that the memory is installed correctly, check the amount of memory (RAM) listed. Grasp the module and pull up. If the module is difficult to remove, gently ease the module back and forth to remove it from the connector.